We talk shop with White's Boots' Customer Service Manager to get the scoop on what it takes to make the best firefighting boot on the market. Rob Smith really, really likes White's Boots. 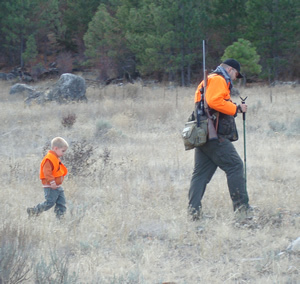 Born in Buckley, Washington, a small logging community on the slope of Mount Rainier, he's been an avid outdoorsman his whole life, and guessing from the photo on the left, it won't be long before his son Ethan gets his first pair of White's boots and follows in his dad's footsteps. Ten years ago, Rob started on the sales floor selling White's at their factory store in Spokane,Washington and he's been a company man ever since. When asked why he likes his job so much, he responded, "We build the best boots on the planet!" and many a hotshot and smokejumper would agree. Rob offers some great tips on how to break-in a new pair of boots, what sort of preventative maintenance you should be doing on the boots you got, and even gives us a lesson in human anatomy when he describes the science behind their patented Arch-Ease system. HF: What's the history behind White's Boots? RS: White's boots started right at the end of the Civil War, back on the East Coast. In 1902, Otto White and his father moved the business out to St. Maries, Idaho. 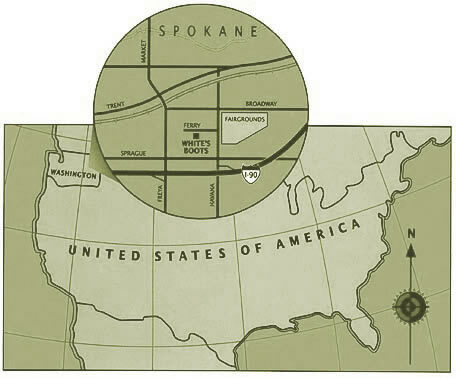 Then in 1915 they moved to Spokane, and we've been here ever since. HF: What's the story behind the Original Smokejumper boot? When did you start making it? RS: Well, we've always made it. It's just the logger boot with a Vibram sole. Originally, when they started firefighting they wanted a good boot, and a lot of the guy had been wearing our boots already cause they'd been working in the woods. So, when they started setting up smokejumper schools, these guys were already wearing our boots. We didn't go out and search out that market - they just found us. HF: The Original Smokejumper boot retails for $450, a hefty price. What is it about the boot that justifies the price? RS: The thing about our boots is that they're all hand-built. From start to finish, there's very little machining in the process. We have guys hand-picking the leather, and we grade the leather here in the factory, then we cut it, depending on the grade, and they match up different parts of the hide with different parts of the boot. Most of the cuts that we use are from the back part of the cowhide or bends, and that gives it the stiffness and rigidity that we're looking for. We take special attention to measure the thickness of the boots to ensure that they meet NFPA standards. We handsew all our boots. All the eyelets are set by hand. You should see some of the machines we use - they're ancient. Nothing fancy here at White's, just old-fashioned hammer and nails technology. What you're paying for is craftsmanship and a human touch, which is rare to find these days. HF: How long does it take to make a boot? RS: In an ideal world, it's a 10-12 day process. But when we get a lot of orders going through the factory, we can get pretty backed up. HF: One of the big selling points for White's is that you offer a custom-built boot. Could you tell us a little bit more about the measuring process? RS: Well, we he have 12 widths for every half-size available, so we can fit a lot of customers with the pre-existing patterns that we have. When someone sends in the measure kit, it has a ball, instep, and heel measurement, as well as measurements up the lower leg from the heel to the mid-calf in 2" increments. At the factory, we'll evaluate all those measurements and if it matches up with a pre-existing pattern, then we'll just build it up. But if we notice deviations and special needs, then we'll make the effort to create a unique pattern to fit the person's foot. For people who have hammer toes or bunions, that's when we start getting into the customization of the last to address their special needs. The made to measure process can add to the overall price about $150.00 for pattern creation and last modifications. But the real key is the way we manufacture the arch. With the Arch Ease system, the arch is molded into the bottom of the boot with an all-leather shank, and the arch holds the foot in a relaxed position, where the heel is elevated relative to the ball of the foot, so your foot is always relaxed. The tendons aren't stretched out, so your feet are not going to get fatigued as quickly. That's how you can wear our boots all day and not have your feet feel so sore. Ever notice when you're at the beach, and you're walking in the sand barefoot, and you just see an imprint of your heel and the ball of your foot? And your arch really doesn't touch the sand? That's the principle behind Arch Ease. There's pressure on the heel, and there's pressure on the ball of the foot, but the arch is just hanging over that support system. So your foot is relaxed. When you're wearing tennis shoes for a long time, you feel that ache in your arch because the tendons that run from the heel to the ball of your foot have been stretched out all day, and they start to cramp up, because they're fatigued, and that's when it starts to hurt. With our boots, you don't have that tension there. We've been employing the Arch Ease system in our boots for decades. HF: When you're on the fireline, and the nearest bottle of oil or polish is a hundred miles away, what can a firefighter do to take care of his boots? RS: The best thing to do is to make sure that they're clean. When you're on the fireline, the debris that you're walking through is pretty cruel on the boot. If you can't oil them regularly, the best thing to do is to clean'em. The other thing is to make sure that they're dried out thoroughly (HF: check out ScentLok's Odor Reducing Boot dryers from Cabelas.com (pictured left). They're only $7.99 and small enough to stash in your line gear or red bag. Definitely a must have.) I know that's a hard thing to do. Another good idea is to rotate them. Have an alternate pair available that you can swap out every other day. HF: That could get a little pricey. RS: Well, in the long run, you come out ahead because if you wear one pair of boots all season-long, most guys might have to send their boots in for a rebuild, or a resoling at the end of the year. But if you rotate them, you can very easily double the life of the boot, because you're allowing them to dry thoroughly. We have a ot of guys who will buy a pair of our Hawthorne series boots because they're about $100 cheaper. Although they're built in the same factory right along side our White's, we just use a slightly different process to construct them. HF: Is there anyway to fill-in or fix those nicks and gouges that you get on the toe-box from an errant pulaski swing? RS: There's not a real good way to fix those, unfortunately. You can put Shoe Goo on'em, but when you're in a fire environment, it won't stay on for long, it'll just dissolve. The best thing to do is to clean out the gouge, and then put on a good quality boot oil and put grease over the top of it to seal it. HF: What do you recommend people use to clean there boots? RS: Just a mild soap. If you have dish soap in camp, you can use that. Just something to get any of that buildup and debris off the boot. When you're dealing with ash and retardant, it's pretty tough to get that out of the boot, but just scrubbing it out will help keep that bacteria growth down. 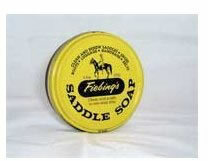 Saddle soap too, would be great, but I doubt most guys keep a fancy shoe cleaning kit in their pack. HF: What's the biggest mistake that you see people make when it comes to caring for their boots? RS: The biggest mistake is not cleaning them before they grease them. You're pretty much shellacking all that debris in there, essentially sealing it all in there, and when you do that, you'll never get it out. Also, some people will often times over-oil their boots. What you have there is that the leather will start to break down, and get really spongey and then eventually crack. There's a happy medium that you need to realize. When you notice your boots getting dry, clean'em, put some oil on, but you don't want to put too much oil on because then you can start doing some damage to the boot. HF: Is there a good rule of thumb to follow for when to oil your boots? RS: It depends on the environment that you're in, and what you're doing with them. We'd love to be able to tell you that you should do it every two days, or two weeks, but there's just no way of telling from person to person. The clerks that work in our store, they can go a month without oiling their boots, not a problem. Because they're not exposing their boots to harsh conditions. But when you're on the fireline, you're exposing your boots to all kinds of chemicals. The chemicals that they put in fire retardant eats up the boot really good, so firefighters have to clean and oil their boots alot more. Use common sense, that's the best advice I can give you. HF: White's sells a boot oil, a leather protector, and a preservative (along with some third-party conditioners and leather care kits)...could you explain the difference between them? They all seem very similar. RS: The White’s Boot oils are all vegetable oil based, and the leather preservative it has beeswax/propolis that has anti-bacteria properties in it to help with waterproofing. They are made by Obernauf’s in Peck, Idaho for us, it’s a 100% all natural product. We also carry Pecard’s which is a great product, it just comes down to brand preference. Over the years we have found that those are the easiest to use and are of good quality for use on our boots. All the oils and greases are very similar, they all do the same thing, preserve and waterproof your boots. HF: What sort of advice do you offer for breaking in a new pair of boots? RS: What we recommend is to put them on and wear them a couple hours a day when you first get them. And then gradually increase that duration of time until you're wearing them all day. And we recommend that when you're breaking in the boots, that you swap them out with a well-worn, comfortable pair of shoes. Because breaking in the arch is a 50-50 thing: you're not just breaking in the shoe, it's breaking you in as well! In the beginning, it can beat your feet up pretty good. There are some people out there who swear by filling their boots up with water and then wearing them until they dry. We do not recommend that you do that. You can prematurely break down the arch because our arches are all leather, and they're nailed into place. If you get'em really wet, and they get a lot of moisture built up in them, the nails can start to work their way out, and that will cause the arch to flatten. The problem is if you don't dry out your boots thoroughly, then the leather is going to shrink, and you're never gonna get that boot back on your foot. I had a guy come in a couple years ago tell me that he waded through a bunch of streams with his brand-new boots, because that's what he was told to do by a buddy. Then he came back to the house, set them on the front porch because they were sopping wet, and let them sit in the sun all day. Next day, he came back to the store because he couldn't get his feet into the boots. That was a pretty costly mistake on his part, because we had to rebuild the entire boot for him. HF: What are your recommendations for storing boots in the off-season? RS: If you're gonna store them, make sure you clean them out really well. Clean the inside and outside so there's no debris on them, then put a good quality coat of oil on them. We also recommend that you take them out and wear them once in a while. Be sure to inspect them regularly too. During the off-season, if you see some stitching coming loose, get them into us so we can turn around and get them back to you well before the start of the next season. HF: Lace to Toe vs. Original Lace configuration. What's the difference? Does it affect the fit, or is purely aesthetic? RS: Well, it's not just aesthetic. Both boots are built on the same mold, it's just that the patterning and the shaping of the toe configuration is slightly different. We've heard from alot of guys that on a lace-to-toe, it allows them put on a thicker sock, which will give them more cushioning, as well as more warmth in the winter time. HF: Do you have any recommendations for specific socks to wear with your boots? RS: We recommend a bunch like SmartWool, Wigwam, Fox River. We definitely recommend a sock specific to boots, with extra padding in the heel and the toe area. We don't recommend cotton socks, because they tend to cause blisters since they don't wick any moisture off your foot, and that causes friction between the boot and your foot. The wool blends are much better at wicking moisture off your foot, and can help keep blistering down considerably. I mean, if you're spending almost $500 for a boot, it's just common sense to spend a little bit of money to get a pair of socks as well. It'll help the boot out as well, because it'll help get that moisture off your foot, and keep it from going straight to the boot. HF: Your boots are famous for the longevity. What's the longest that anyone has ever worn your boots? RS: That's funny that you ask that. A couple days ago, I got an email from a gentleman who's going on 33 years with the same pair of boots. He's had a few rebuilds and resoles in there, but otherwise, it's the original boot. He said they look almost exactly like they did when he bought them. Not sure what sort of environment he's wearing them in, but he said they're 33 years old. We've had made-to-measure sheets from guys who are now in their 90's. Think they mostly wear them to church now, but still. It's pretty amazing to listen to guys come into the store and tell the stories about what they've been doing while wearing our boots. HF: Rob - you're a wealth of knowledge. Thanks for taking the time to talk to us! For more information about White's Boots, check out their website. And if you're ever in the Spokane, Washington area, you're welcome to stop on by the factory and see the magic happen. Just tell'em we sent you over! They might give you some free popcorn or something.